Who was the hero of week 1? 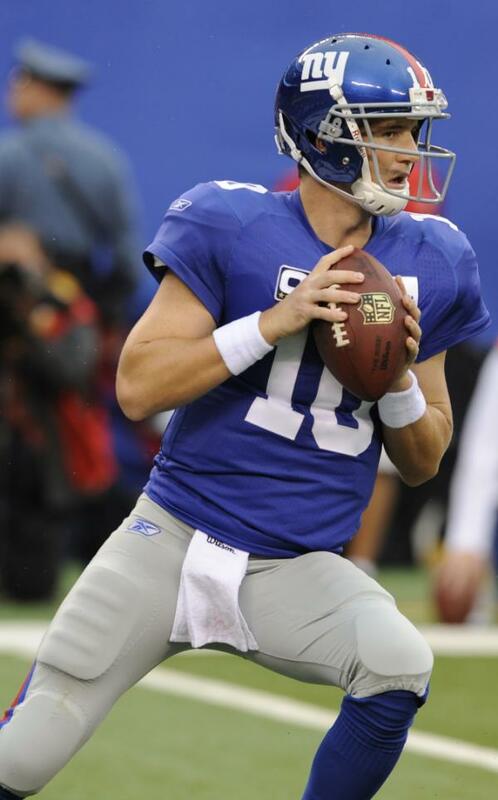 Eli Manning with +0.58 WPA in the Giants' victory over the Panthers. Miles Austin tops the wide receivers with an incredible +0.68 WPA in the Cowboys' loss to the Redskins. But that was mostly due to a +0.60 WPA play at the end of the game. Austin's 30-yard catch over the middle set Dallas up for what was almost a miraculous victory, if not for Alex Barrons' clothesline hold on Brian Orakpo. The Texans' Arian Foster leads the running backs with a dominant +0.26 WPA in his break-out game against the Colts. I thought it would be higher. Todd Heap leads tight ends with +0.27 WPA, +0.16 of which was thanks to a deep catch in the final minutes of the Ravens' win over the Jets. Shaun Hill rescues Mark Sanchez from being the goat of the week. Hill played poorly in relief for Matthew Stafford, and couldn't get the TD the Lions needed at the end of the game. Of course, it's hard to count that controversial call against him, but even WPA has to follow the rules. Linebacker Bryan Thomas of the Jets tops defensive playmakers. His sack early in the loss against the Ravens forced Joe Flacco to cough up the ball deep in Baltimore territory. But the bigger play was a late-game stuff of Ray Rice for a 2-yard loss, helping knock the Ravens out of FG range and forcing a punt. The Ravens' Hiloti Ngata returned the favor with a sack of Mark Sanchez for an 8-yard loss on the final drive of the game, putting the Jets in a hole from which they never recovered. Kyle Vanden Bosch tops the defensive ends with his 10 tackles, including 1 for a loss. Troy Polamalu's late-game interception of Matt Ryan puts him on top of the safeties so far, but I wouldn't bet against him staying on top. Let's just hope he breaks the dreaded "Head and Shoulders" Curse. It's a well known statistical fact that NFL players who appear in dandruff shampoo commercials play in only 5 or less games for the current season. DeAngelo Hall's fumble return for a TD made the difference in the Redskins win and helped him rack up 0.45 +WPA, nearly twice as much as the next cornerback. You can get to the individual stats throughout the season via the drop down menus in the site header, or using the menus below. WPA tends to overweight the end of the game (or give it no weight at all if it's a blowout) but it's really a terrific stat anyway. Thank you. I got the D right, anyway. Yes, it's true WPA heavily over-weights the ends of games, but that's its purpose. For those who prefer unweighted, the tables can be sorted by EPA, or EPA/play. I'd like to see some stats on red zone success this last week. It seems that lots of teams didn't do well. Anybody know who's stats dropped from Monday to Tuesday sept 14th 2010? Is it possible to give us Mendenhall's regular time WPA and EPA? His 50 some odd yard run for a TD in overtime kind of inflates his stats, and I'm curious how he performed otherwise. Quick answer is to go to the WP graph and note the WPA of that final play. Looking at your chart, Arian Foster didn't get much WPA for his last two touchdowns. But the model is based on situational league historical values, right? So the pre-touchdown WPA assumes that the losing team has an "average" offense, one that is very unlikely to score two or three touchdowns in the final quarter; ergo, padding a 20-10 lead with only 9 minutes left to play (and when you're in good field goal range, meaning 23-10 was already likely) isn't measured as particularly valuable. But hindsight, and (more importantly) knowledge of the Colts' offense, tells us that it really was. I love the stats ... lots of great work! Which stat could I use for looking at possible fantasy player ww pickups? Just a hunch: I would look for palyers with high Success Rates, but who have not been lucky enough to break off long runs/catches or get a bunch of TDs. They're probably undervalued.